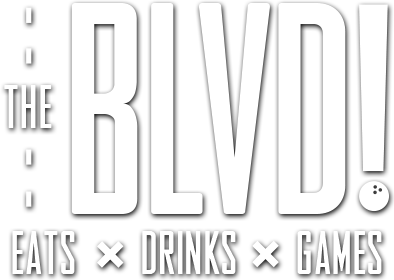 Get to know The BLVD! through our Event Planning Guide where you will find information about our event spaces, entertainment options, audio visual capabilities, accessibility, our many chef inspired food options, and our beverage packages. Explore our event spaces to better understand capacity, seating vs. reception, entertainment availability, and audio visual capacitates. Explore our food & beverage options ranging from hand-made appetizers & pizza to a full dinner spread including chef-inspired appetizers, salad, entrees. Whether you need a quick bite or a full meal, we’ve got a package for you. Enjoy a variety of beer, wine, and cocktails with a customizable bar package. Enjoy in combination of arcade game play, billiards, bocce ball in the Beer Garden, and Bowling! The BLVD‘s Ap’PINtizer party is great for any type of event! Whether you’re hanging with friends, celebrating with coworkers, or anything in between, you cant go wrong with mouth-watering appetizers and bowling. Ask about our Event Enhancements including drink tickets, specialty food, additional entertainment options and more! Contact us today to get the party started! For parties of 10-36 people.